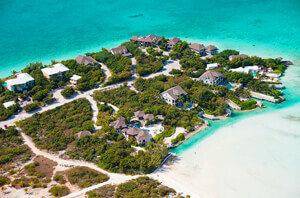 Turks and Caicos is home to the Caribbean’s most beautiful beaches and most luxurious villa rentals. 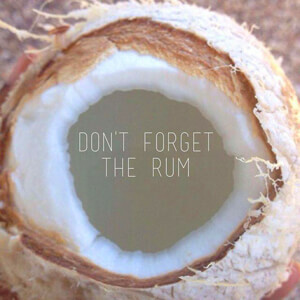 At WhereToStay, we want to help you find the perfect vacation rental for your Caribbean getaway. 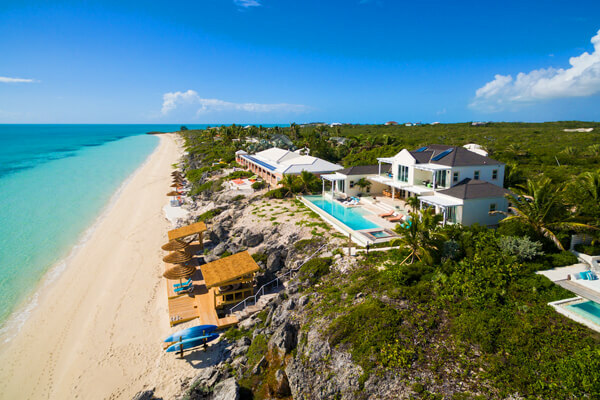 To make your planning process easier, here’s a list of Turks and Caicos villas that are perfect for a 2018 beachfront vacation. This one-bedroom honeymoon villa sits steps away from Sapodilla Bay’s white sand beach. Nightly cotton candy sunsets contrast beautifully with Amalfi's chic, marble interiors. 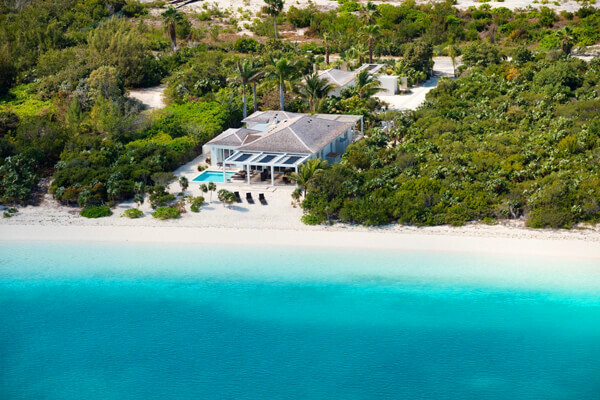 You can take the villa’s kayak and stand-up paddle board out on the sea or cross the street to calmer waters in Chalk Sound. 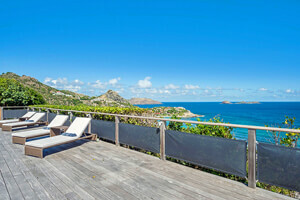 Celebrate each day from the master balcony with a glass of wine, your sweetheart, and the sweet, salty breeze. Similar to Amalfi, this one-bedroom romantic getaway has gorgeous pastel sunsets and a two-level structure. Bari stands out because it’s a few feet from Taylor Bay, the quieter counterpart to Sapodilla. The villa’s colorful, chic design echoes its tropical surroundings, which you can take in from the pool deck or the master balcony. You won’t have to sacrifice the ocean view as you soak the day away in the bathtub, since the master suite has a modern, open layout with the sea as its focus. This beachfront two-bedroom is on glamorous Grace Bay. This location gives you panoramic ocean views, convenience to boat charters and maritime excursions, and easy access to a white sand beach. Inside, there’s warm, modern accents like a floating wood staircase and three hidden, flatscreen TVs. 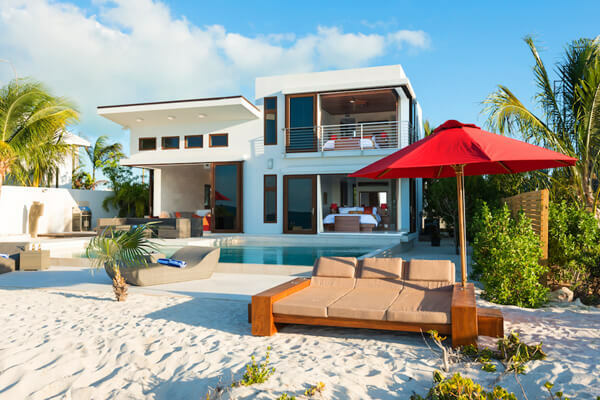 Share this villa with your best friends for the perfect Caribbean vacation. 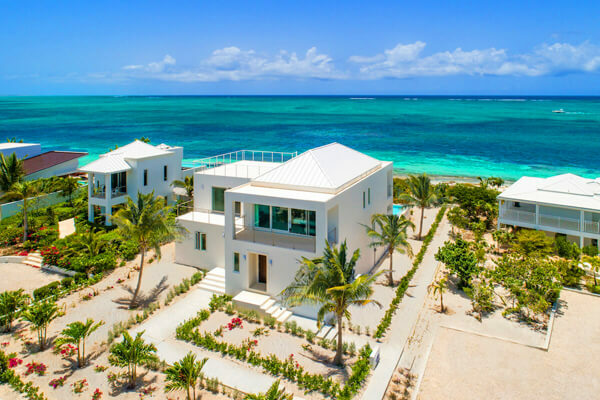 Sandwiched between Grace Bay and Turtle Cove Marina, this two-bedroom villa manages to feel private and spacious despite its popular location. Staying in Sandcastle gives you a huge infinity pool and an expansive, open-concept living area to relax in. Both master suites have king beds and ensuite bathrooms, so every room feels like a personal retreat. 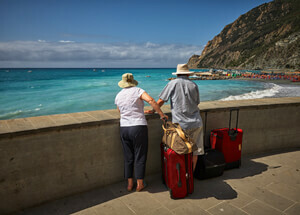 Rent with another couple for a breezy vacation. Sandpebble has the same enviable location as Beach Kandi and Sandcastle, but it offers three glamorous bedrooms instead of two. 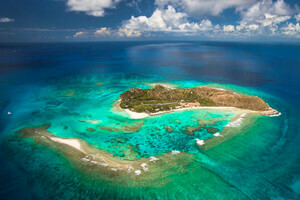 Smith’s Reef, one of the island’s best snorkeling reefs, is a short walk away. It’s the little things that make this villa special: manicured gardens along the property border, chic blue decor, greyscale backsplash in the kitchen, and rustic wood accents in the master bedroom. 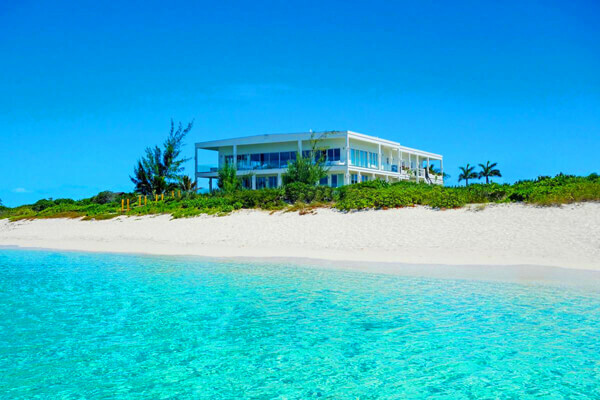 This is the perfect beachfront villa for families or friends. If you plan to go on a lot of tours and excursions, then this four-bedroom villa is perfect for you. 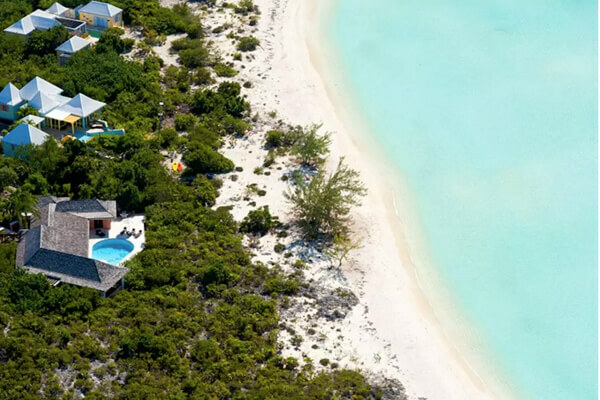 Aquazure is located between Grace Bay and Leeward Marina, so you can spend the day on the beach or book a trip to go deep-sea fishing, island hopping, or sailing. The villa itself is contemporary and open, with living and dining space inside and out. Three bedrooms are in the main house and one is in its own guest cottage, so you could rent this villa with your in-laws for a family getaway. Expect privacy and convenience at this Taylor Bay four-bedroom villa. 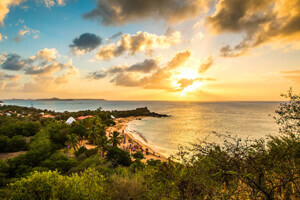 It’s nestled in lush vegetation, with a short path leading to the beach. Even though it’s surrounded by thick gardens, you’ll still have great views thanks to its elevated perch above the coast. This would be a great family villa, especially because its not right on the beach. A wide stone staircase leads from this four-bedroom villa’s back deck down to the beach. On the beach, you can relax in adirondack chairs, skip over the waves, or kayak out into the open water. This villa has a feature for everyone, including bookshelves filled with novels, several dining areas, a flatscreen TV, and an entertainment system. 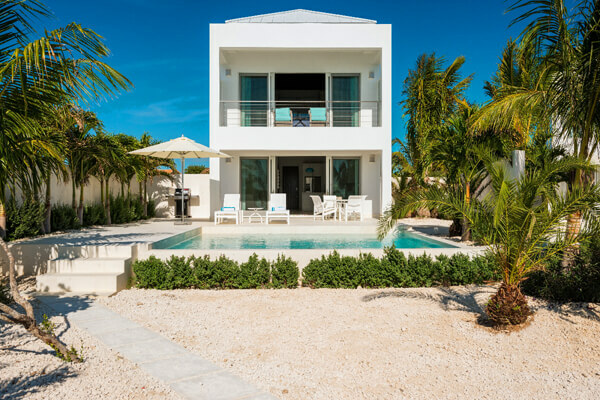 Two suites have king beds and two have queen beds, so you can bring friends or family along on this Turks and Caicos vacation. Four of the five bedrooms in this chic beachfront villa have gorgeous ocean views through sleek glass doors. Don’t stress about the lack of amenities in the fifth suite though- it has two queen/twin bunks perfect for kids. 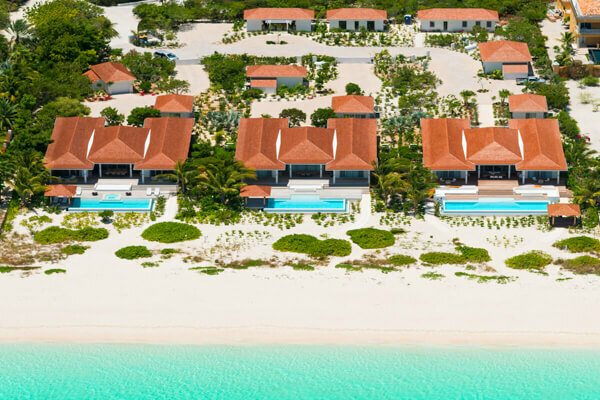 Speaking of amenities, Aguaribay is stocked with daily housekeeping, a sound system, WiFi, air-conditioning, an infinity pool, and a kayak. 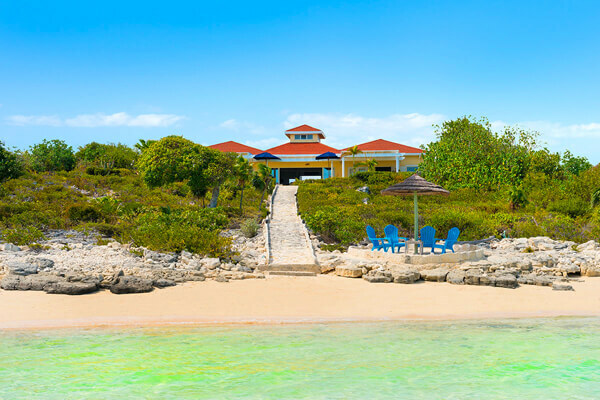 Long Bay isn’t as popular as northern Grace Bay, so you’ll have the sea to yourself. 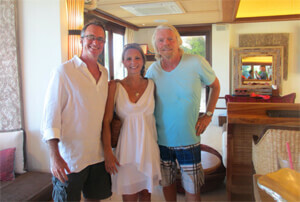 Booking a stay at Isla will make you the most popular person in your friend group. The infinity pool stretches across a private slice of the beach, the turquoise sea is steps away, and all five king suites have ocean views. Enjoy a bottle of wine under the beach palapa as the sun sets over the sea, then move up into the hot tub for stargazing. 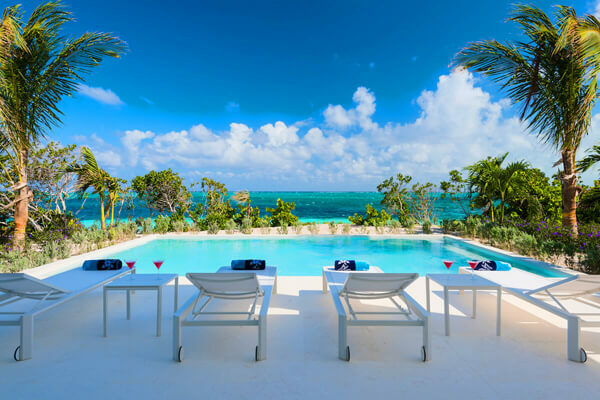 Luxury-seeking travelers will fall in love with this micro-resort. 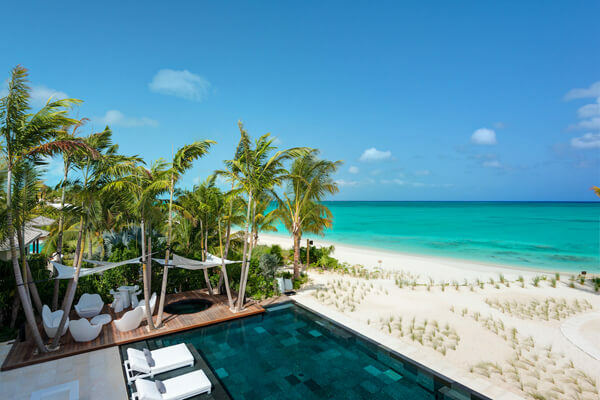 The Residences combine the comforts of home with five-star service and 95 feet of nearly private beachfront. The interiors and all five bedrooms are open and modern, with nature-inspired accents that will help you find your inner Zen. 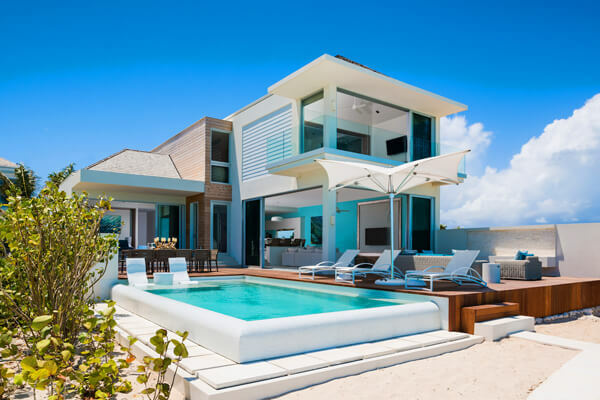 Glass walls and turquoise ocean views take this modern, five-bedroom villa to the next level. Nearly every room faces the sea and opens to a balcony or terrace, so you can breathe in the salty air and soak up the sunshine 24/7. Four of the suites have king beds and the fifth has two twin beds, so this Long Bay beachfront villa works for a couples’ getaway or a family vacation. 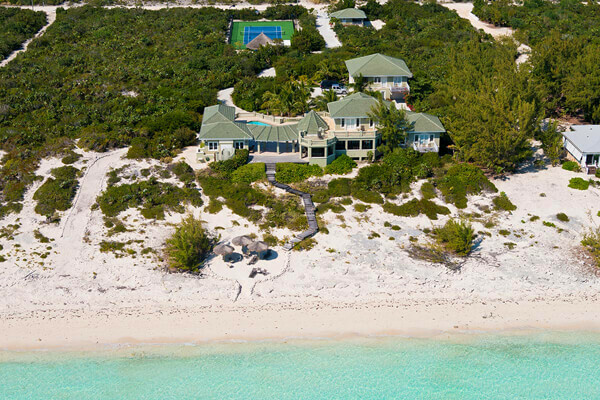 This six-bedroom beachfront villa has every amenity under the sun. It’s fully gated, within walking distance of several activities and restaurants, and has a gourmet kitchen, private bar, and several smart TVs. You can spend all day in the sun thanks to the pool, tennis court, water sports equipment, and canal boat dock. There’s even a villa attendant to set up beach chairs and umbrellas on Grace Bay. Gorgeous blue mosaic tiles sit at the bottom of the infinity pool at this six-bedroom beachfront villa. You can relax under the palm trees on the patio or under beach umbrellas by the sea. Watch the sunset from the sunken lounge or watch movies on the flatscreen TV under the dining veranda. The chef, butler, housekeeper, and poolman add another note of luxury. 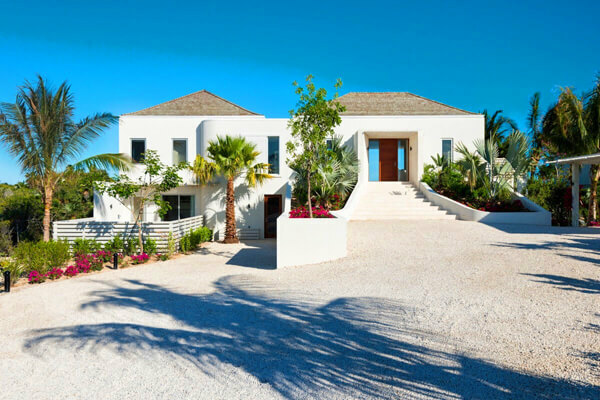 The white sand beach is practically perfect at this luxurious, modern seven-bedroom villa. Make the most of its beachfront location by watching movies in the outdoor media room, kiteboarding off the coast, or sipping wine around the fire pit. You’ll be totally pampered at Triton thanks to the daily butler, housekeeper, security, and chef. 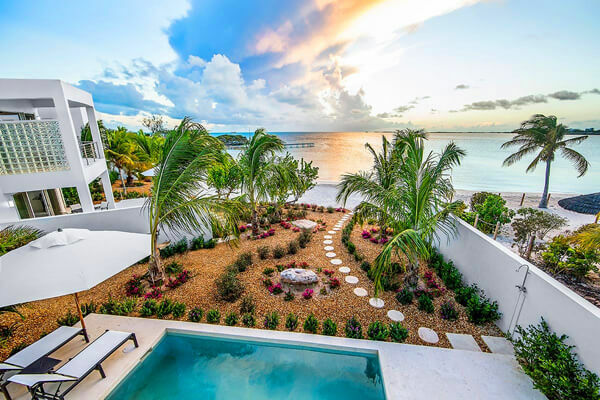 Nestled between Long Bay Beach and private tennis courts, this nine-bedroom estate is ideal for Caribbean weddings, luxury vacations, and family reunions. The substantial indoor and outdoor kitchens will please any chef, and there’s several places to dine with an ocean view. Between the main villa and the guest house, everyone on your guest list will have room to kick back and relax. 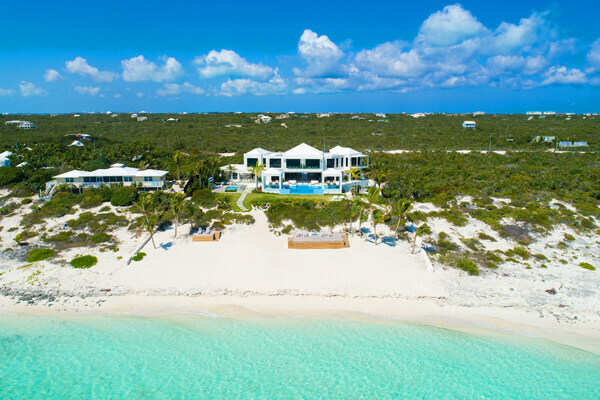 White sand beaches, tennis courts, and lounging space abound at this beachfront luxury estate on the northernmost tip of Grace Bay. With a private gym, tennis courts, and water sports equipment, there’s always something to do at this ten-bedroom property. As if that wasn’t enough, there’s also a chef, a housekeeper, and a butler to take care of your every need. 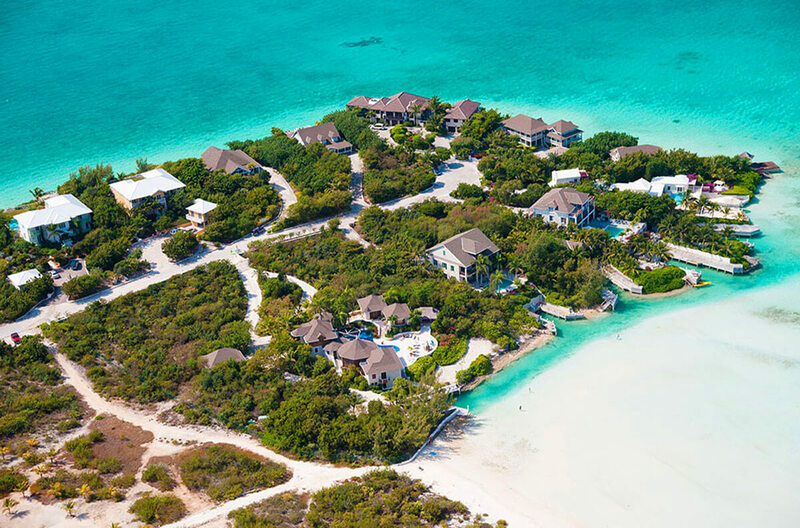 At the end of the day, staying on any beach in Turks and Caicos is better than staying where you are right now. If you're interested in any of the villas above, click on the villa name in blue and you'll be led to the property's booking page. 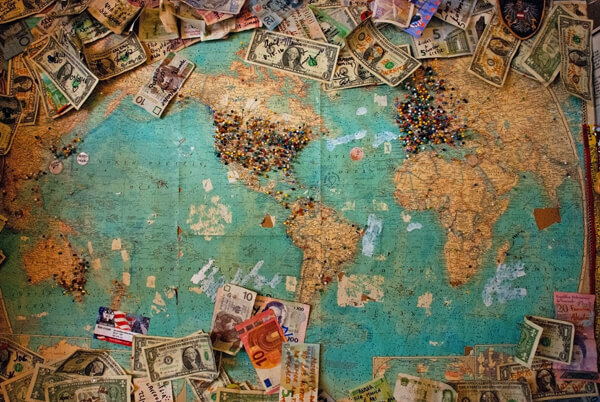 U.S. readers can call 800.869.8017 to contact one of WhereToStay's Caribbean villa experts, and international readers can call 214.350.6220. 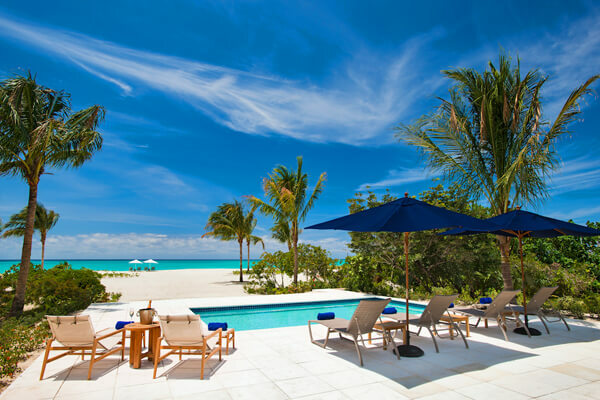 Our team has traveled far and wide across the islands, and we want to help you find the perfect Turks and Caicos beachfront villa for your 2018 or 2019 getaway.